The masks for the Cutpurses in Geppetto are of somewhat unusual design. The story behind their look starts long before Geppetto was even being developed. Masks from the 2012 production "Pericles." It all started with my first mask project: Pericles, Prince of Tyre. I was directing for a festival where five different groups were tasked with producing one of the acts of the Shakespeare play. 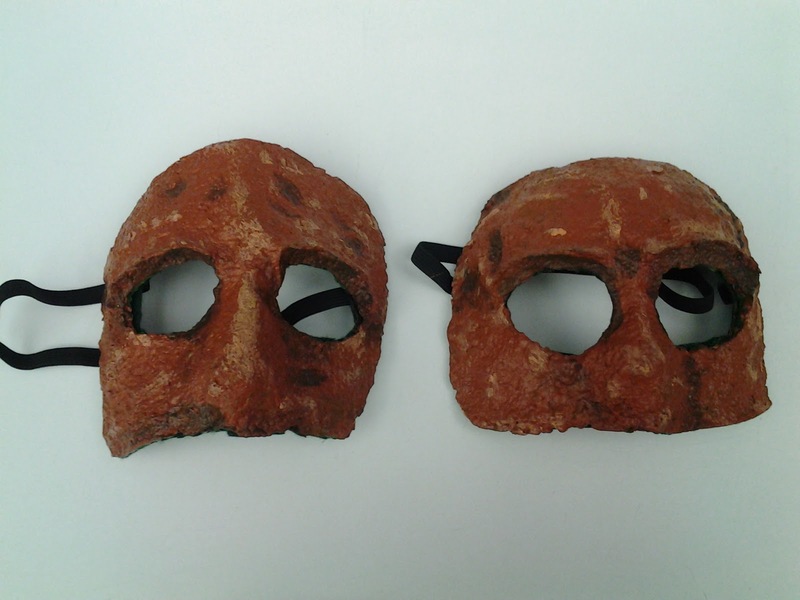 The concept was to perform in mask and each of the different locations Pericles visited had different colored masks. The green masks were created for Pericle's visit to Tarsus where they were starving. I wanted to create masks that made the characters look hungry and a little sick - hence the green. 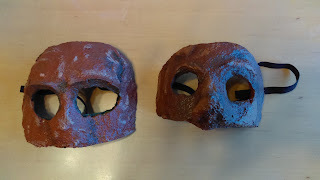 Masks repainted for the 2014 "Geppetto." Fast forward to 2013 when I was beginning to create the masks for the workshop production of Geppetto. I was looking to reduce my workload by reusing any masks from previous projects that I could. Since there wouldn't be many opportunities to reuse solid green masks, I decided to repaint them for Geppetto. So the masks were repainted orange. Brian Hurst and Blake Williams created the roles of the Cutpurses and use the mask to channel some Muppet energy into their characters. When I left Chicago for Madison in 2014, I gave the mask on the left to Blake Williams who had worn in it both productions. So when the Broom Street production of Geppetto was announced, I now had to come up with a new partner to the remaining original Cutpurse mask. Looking again to reuse existing masks to cut down on my workload, I decided to repaint this mask that I had made as an exercise to build interesting noses. I had never known what to do with it (as it was an odd look) and named it "Pinocchio." I thought the pointed nose would make a fun contrast to the mask with no nose. So here are the repainted Cutpurse masks ready for a new life in the 2017 production.